Definition of Medicine Bag: What is Medicine Bag? A Medicine Bag was a special, sacred container for various objects, or amulets, of supernatural power used, or provided by, a Medicine Man or Shaman, to carry 'medicine', or symbols, of animal spirits good luck, protection and strength in battle. The Medicine Bag contains both symbolic and ritual items. Typical items found in a Medicine bag, or bundle include various herbal remedies including tobacco, cedar, sage and sweetgrass used in Smudging Rituals. Other objects include a pipe, paint and skins and appendages of various animals - for additional information refer to Medicine Pouch. The Shaman of the Great Plains tribes, notably the Pawnee tribe, also included a Star Chart & Astrology Map in their Medicine Bag or bundle. A 'medicine bag' was an important part of the equipment used by a Shaman. It was a special container for various items of supernatural power used by a Medicine Man to carry 'medicine', or symbols, of animal spirits used for treating sickness and disease. Traditionally a medicine bag or bundle contains something from the plant, animal and mineral kingdoms and from the life of man. Medicine bags of Shamans were often made from pelts of panthers, raccoon, otter, beaver, reptiles or birds and included items to aid in healing, in rituals, Spiritual Healing and altering the weather. The inclusion of paint in a Medicine bag was an important addition to the bundle. 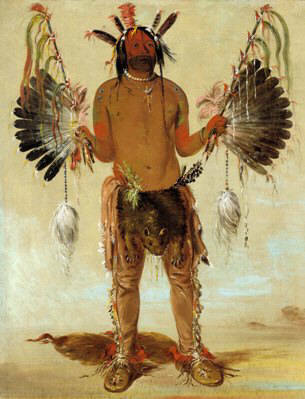 Medicine Men often chose certain mystical markings for warriors and that powerful magic was passed on during the application of the War Paint helping the warrior to believe himself invincible. When a boy turned fourteen or fifteen his entry into manhood, his rite of passage, started with his Spiritual Journey on a Vision Quest. During the Vision Quest a Spirit Guide was revealed. This Power Animal was believed to walk through life with them. The Shaman would discuss the meaning and significance of the Spirit Guide and provide then with a personal bag or pouch containing various symbolic items. These Medicine bags were religiously closed and sealed and seldom, if ever, opened. Typical powers ascribed to medicine bags included increasing hunting abilities and aiding fighting skills and help increase his safety and protection during life. These bundles held the greatest importance to the Native Indians who often carried such a bag or pouch around the neck. The Medicine Bag was carried through life for good luck, protection and strength in battle. In death, the bag and symbol of his Guardian Spirit, was buried with the Indian and decays with his body. The value of a Medicine bag was beyond all price. To lose a bag, especially to an enemy, was deemed to be the greatest dishonor, loss of face and a bad omen for the future. A man who lost his medicine bag or bundle was referred to in degrading terms such as "a man without medicine" or "he who has lost his medicine". His only recourse would be to try to replace the Medicine bag. This could only be done by charging into battle and plundering a Medicine Bag from an enemy, who he has killed with his own hand. This practise was a powerful inducement to ensure that all Native Indian warriors fought fiercely in battle. Should a white man even touch a Medicine Bag this was seen to be a sacrilegious act.